Thank you sir. I saw a picture of an Ercoupe with a similar scheme and fell in love with it. The plane didn't finish out as nicely as I originally had hoped. Partly due to the design of the kit and much to do with my skills. Near the end of the build I realized where this was going and made the decision just to get it finished and flying and move on to the next one. It was fun and I learned a whole lot from the experience. The new prop adapter showed up in today's mail. It is of the type that squeezes down on the output shaft as you tighten the prop nut. (No grub screw to strip out.) So next Saturday, hopefully, we'll learn if she flies. Love the finished scheme...a real beauty! I didn't get to maiden the Ercoupe Saturday as planned. It was a great day for flying and all of my other birds got a great workout. But when it was time to fly the Ercoupe the prop kept coming off, shaft and all. After several attempts to tighten the grub-screw on the prop adapter I decided it simply was not going to hold. So, back into the truck it went. I ordered a new prop adapter today and, hopefully, it will hold up and the maiden will happen next week someday. Which brings me to the Park 250 motor. A word to anyone following this thread: do not waste your money on that motor! The motor itself may be OK but the prop adapter doesn't increase the shaft size for the prop so you're stuck with trying to find a prop to fit a 2mm shaft. (good luck). And then, after making modifications to your prop so it will acomodate the tiny shaft, the prop adapter is of such soft and cheap material that you cannot lock the prop adapter to the output shaft. What I learned from this? Find out what size motor you need and order it from Hobby King or some other cheap source. At least then, if you have trouble making everything work, you won't be stung by the realization that you got hosed for the price of the motor by Horizon Hobby. 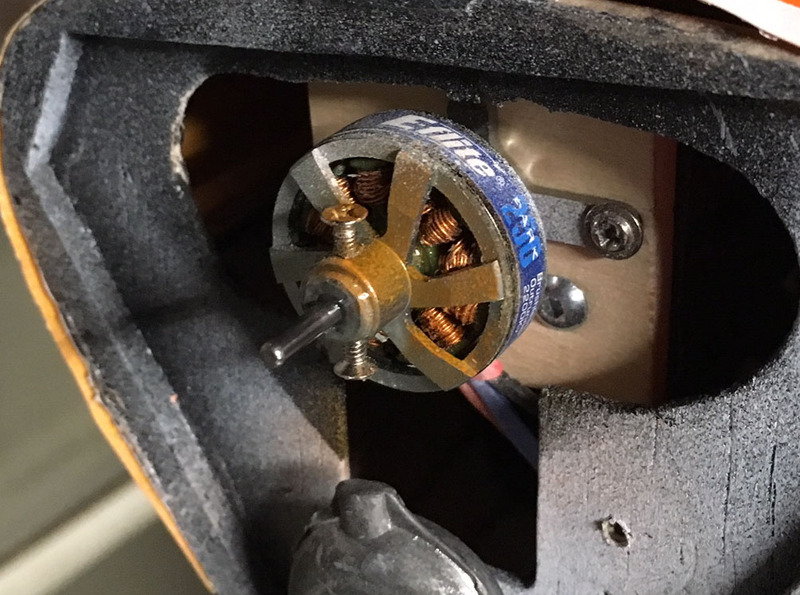 If you do get a motor with a 2mm shaft plan on ordering a prop adapter that will size things up to fit the larger, more standard prop shaft diameters (i.e. 5mm). Here's the finished Ercoupe. The weather forecast for tomorrow looks pretty good so we may find out if it's airworthy. The build has been very entertaining and brought back many memories of building boards and of airplanes of long ago. Regardless of the outcome of tomorrow's flights I'm already planning the next one! I'll post the results of tomorrow's flights here. And, if anyone is interested, I may include a brief review of the kit. She looks great! Well Done! The building phase of this plane is about finished. Just need to do some finish sanding and a few other small tweaks and she'll be ready for covering. I'd originally thought I'd cover this plane with polyspan but after the tests I did with the material I've decided to stick with good old silkspan and dope. The second photo is included to show the cavernous battery/electronics bay that was created by the canopy modification. I was concerned about how much weight this plane was accumulating. At this point it tips the scales at 6.5 ounces (w/o battery and aileron servos). That's not bad and I'm confident that even with covering and paint she'll still come in at a very flyable weight. That's pretty much how I had this figured. Instead of pins I added a small tab of balsa that slips under a notch in the forward former. Indeed! But let's not forget the rubber bands and tiny little Harbor Freight squeeze clamps. Looking very good and I like the removable Canopy for battery access. Great idea. 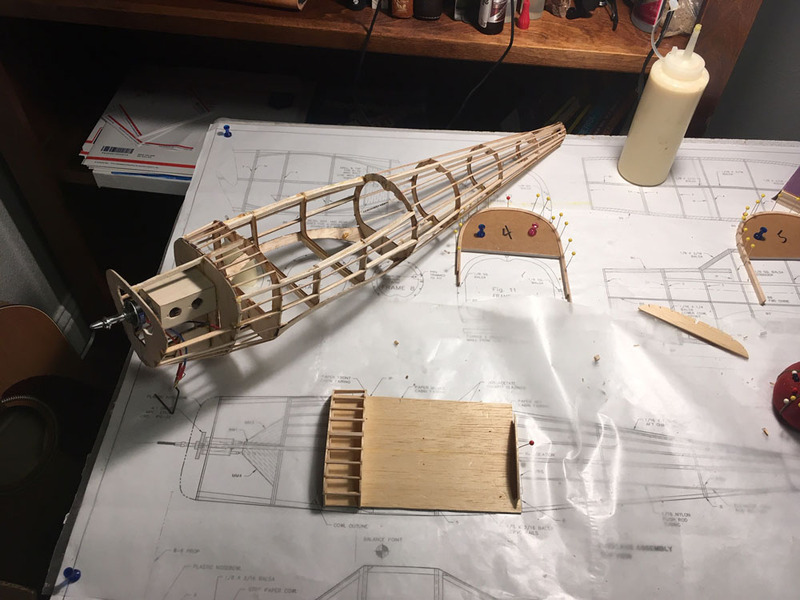 The Ercoupe project slowed down a bit since Thanksgiving but I did manage some progress. I got the fuselage basically completed and, in the process, encountered the need for a couple modifications from the original plan. This airplane was originally designed for a geared in-runner motor and I chose to use a Park 250 out-runner. This called for a change in the motor mount. Also, the original plans called for removal of the wing every time the battery needs to be changed. The longer I thought about how inconvenient that was going to be the more I felt compelled to find a way to correct it. In the first photo below you can see the fuselage basically complete sans Rx and servos. The second photo shows the plane with it's canopy removed. I am now preparing the plane for a lift-off canopy which will provide access to battery, Rx and servos from above. I intend to add some additional beef in the side-walls of the fuselage frame to compensate for the loss of strength in this area. It has been an enjoyable build so far but the learning curve has been steeper than I expected. 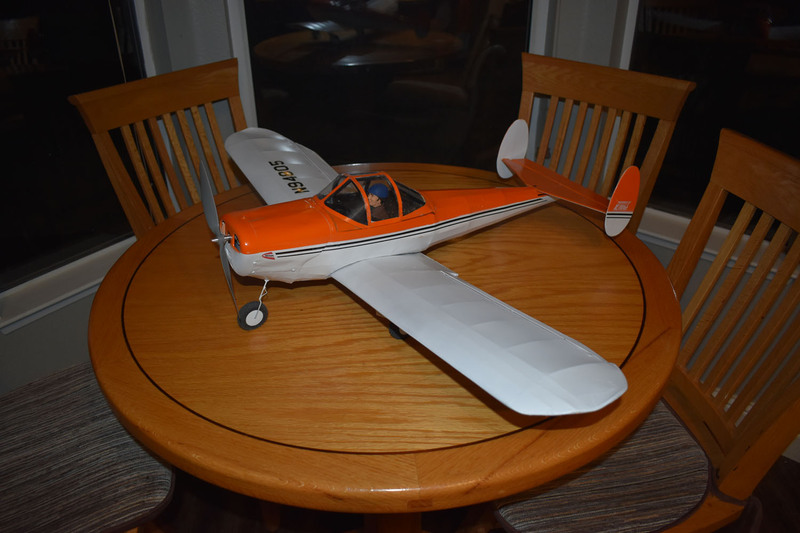 The airframe itself is very lightly built and is more like a free-flight rubber model than what I had expected for a powered RC plane. While that makes for a more "fussy" build the end product should be a sweet flying bird. Issues such as deciding which glues to use and what covering to buy have underscored my decades away from the hobby. After a good deal of reading I've settled on good old TiteBond Original for construction. It is definitely strong enough. I like having a good long "open time". It is easily sand-able and can be used to create glue-fillets for reinforcement. I'm not concerned about the delays waiting for it to dry and I am convinced the joints will hold up for as long as the model is likely to live. Saves trying to make them the exact length you need. Great idea Mark. Thanks for sharing that! As I suspected, there was little opportunity to work on the Ercoupe over the Thanksgiving weekend. But company is now back at their own homes and I was able put in some time at the bench this evening. The wing, horizontal stab and vertical stabs are completed and sanded. This kit is designed very light and, as I am learning, this seems to be a trademark of a Tritle design. It was difficult to handle the wing for sanding without breaking ribs from just the slightest pressure. I did need to make two repairs, neither of which were of great consequence, but it is illustrative of how lightly constructed this airplane is (more like one would expect in a rubber powered free flight model). Sanding the leading and trailing edges to final shape was very time-consuming since they start as rectangular stock. I seem to remember leading edge and trailing edge stock being pre-milled in kits I built "back in the day". Not really a big deal but it did add a couple of hours to the build.